An urban St Louis bed and breakfast in a wonderful little neighborhood, Benton Park. Stroll or jog around the beautiful 14 acre park right across the street from the Inn. We’re a short walk to a dozen great restaurants, and a couple of bars and coffee houses. Check out the Anheuser Busch Brewery and the Clydesdales just up the street. Tours come with free beer. Don’t miss Gus’s Pretzels, a St Louis tradition. Couple miles from downtown and the historic Soulard Market. We’re a short drive to everything St Louis has to offer. I love living here and love sharing it! To make a reservation to stay with us visit our on-line reservations system or by giving us a call at +1 (314) 669-6196. We looking forward to being your hosts! Click below see take the tour. Many people, when they think about bed and breakfasts, picture bucolic, quiet, country settings with all of the amenities of rural or small-town life. For example, in Missouri, there are a couple of dozen of inns located along the Missouri Weinstrasse and the Katy trail, from St. Charles westward to Hermann. In contrast, the Benton Park Inn is very much in an urban environment. Created by St. Louis City ordinance in 1866, Benton Park retains much of the character it acquired throughout the nineteenth century. Many German immigrants arrived here during that time, and many – if not most – of the homes retain their original architectural details. A wonderful B & B located within an easy driving distance to the Missouri Botanical Gardens and all the things to see and do in Forest Park. 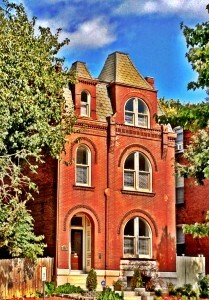 It's location across from beautiful Benton Park in a charming quiet neighbor was also a plus. Dan was a wonderful host who served a great breakfast and conversation to match. What a wonderful weekend...1st B&B experience and well worth it. Dan told us to feel at home and we did. Comfortable beds, cozy rooms, and fantastic food. Looking forward to staying again. Thanks Dan for a wonderful weekend. Love is INN the air! HAPPY NEW YEARS TO ALL OUR FAMILY AND FRIENDS.